The most prominent Civil War poetry is poetry of the battlefield. The war has been immortalized in countless sweeping odes about fallen soldiers and righteous bloodshed. Julia Ward Howe’s “Battle-Hymn of the Republic” sings of “fiery gospel,” blaring trumpets, a “terrible swift sword.” Walt Whitman’s famous elegy for Abraham Lincoln, “O Captain! My Captain!”, juxtaposes lurid “bleeding drops of red” with trilling bugles and exulting masses. Often called the Poet Laureate of the Confederacy, Henry Timrod compared the creation of the Confederate States of America to a new star appearing in the night sky, called the oncoming war a “rapturous sight,” and believed that God would make the new country “great and rich.” This is poetry meant to stir the blood of soldiers and civilians alike, meant to inspire action and sentiment on a grand scale. Not all poetry written during the war had such lofty aims, however. 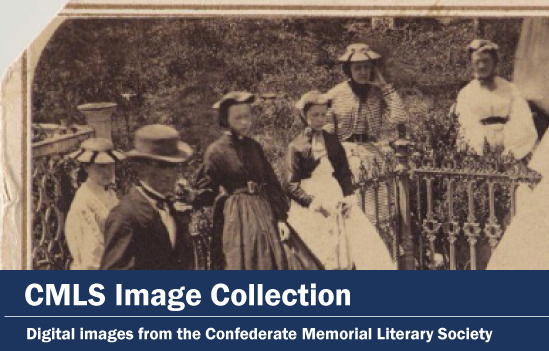 The soldiers’ letters found in the Confederate Memorial Literary Society Manuscript Collections (CMLS) managed by the Virginia Museum of History and Culture are full of intimate, personal love poems written by soldiers to their wives, families, and love interests on the home front. Soldiers’ love poems lack the grandiose pronouncements and political rhetoric of Howe, Whitman, and Timrod. Nevertheless, the poems have much to say about the experience of soldiering and the literary culture of the 19th century. Three exceptional love poems from Confederate soldiers have recently been added to the archives of the VMHC. Click on the image of each letter to see it in an expanded view and click on the “i” icon to more clearly read each letter’s text. But the donor shall not cease to live in this heart. And grow brighter and fairer in the lap of heaven. The mem’ry of holy and simpler days. Unfadingly bright, aye forever divine. I’ll keep the sweet flowers, and will not repine. Ah, no, for they’ll whisper the off’ring was thine. And there’s nothing to make me glad. Like an echo of wild despair. Too bright and too happy to last. And make thee well again. Should fly at their earliest birth. For there’s nothing to make me glad. Has ever been known than mine. In my bosom, joy instilled. Or coarsely mock affection’s name. These poems are in many ways typical of the literature of their moment. Scholars have long considered the literature of the Civil War era to be underwhelming and insufficient. In 1867, Atlantic editor William Dean Howell declared that the literature had “staggered very lamely” to interpret the cataclysmic war (Steinmetz, vii). 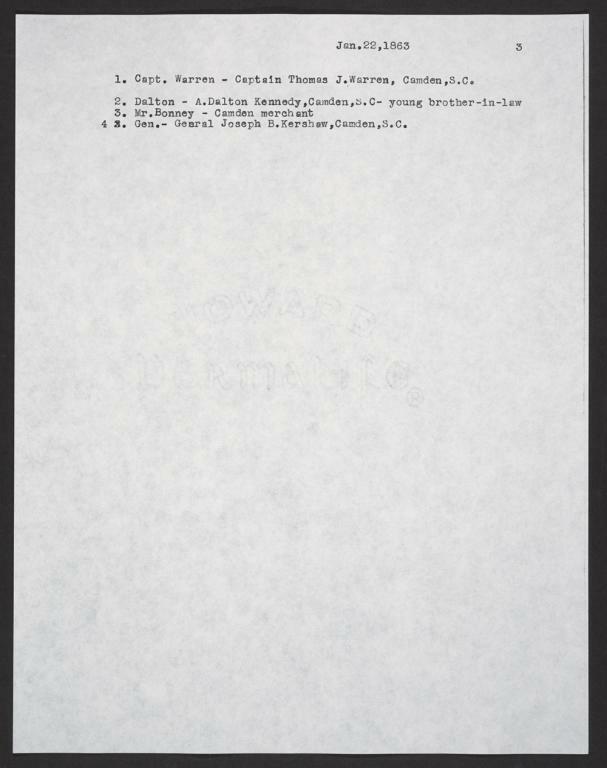 In 1959, literary scholar Lee Steinmetz wrote that war poetry of the time was “aesthetically inferior… usually interesting, frequently amusing, occasionally hilarious” (xxi). The literature could not live up to its subject, so the story goes. Indeed, these poems don’t offer much by way of aesthetic originality. Flowers, heaven, twilight, a summer day, gently falling tears – the poems read like a laundry list of sappy clichés. Doby leans on stock imagery of northerners as “vandals” and invaders. Southern poets in particular were tasked with creating a new literary tradition, free from the yoke of northern culture. These poems represent their failure, symbolized most saliently by the meter of Barksdale’s poem – it’s anapestic tetrameter, the same as the “Star-Spangled Banner.” An ironic connection to say the least. These soldiers’ maudlin sentimentality and unflinching adherence to literary convention prevent them from covering any new interpretive ground. Yet it’s worth pausing to note the considerable technical ability on display in these works, because the soldiers’ poetic know-how offers a testament to their society’s literary bent. 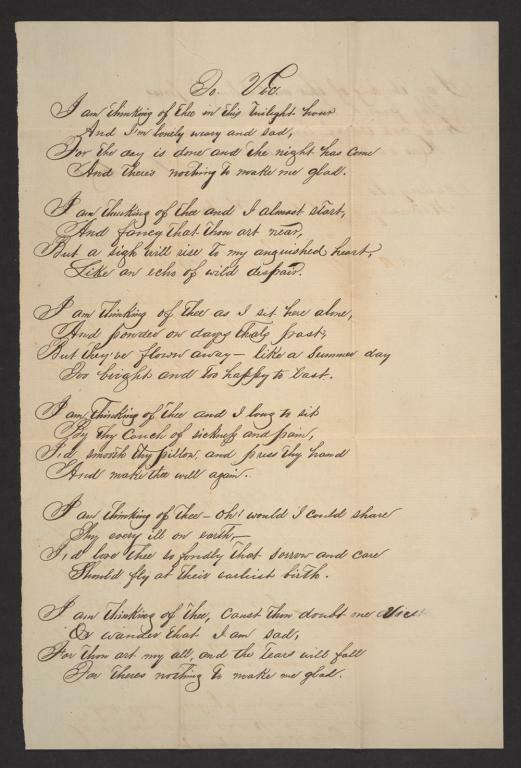 Barksdale’s rhyme and meter are regular throughout the poem, and he has a good eye for metaphor – “As precious will seem each remembrance of me / As the dew to the flower, the bud to the bee,” he writes, incorporating a nimble alliteration with “the bud to the bee.” He uses smooth assonance to emphasize the poem’s emotional climax at the beginning of the last stanza – “A soldier boy’s fate takes me far from my home / From those that I love, the land where I roam,” he writes. The echoing ‘o’ sound on soldier, from, home, those, and roam gives the couplet a mournful, melancholy power. 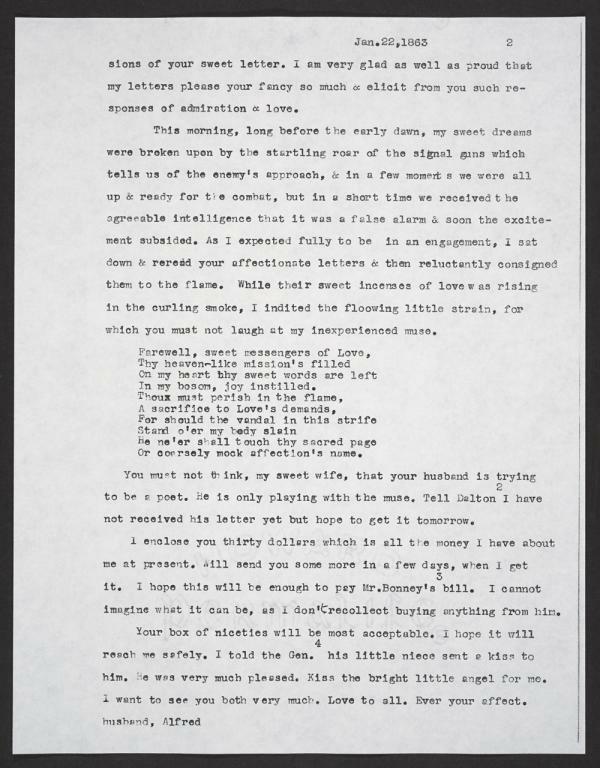 Meanwhile, Doby directs his poem to the letters he is burning, a clever rhetorical flourish that capitalizes on the bittersweet tragedy of the act. The rhyme scheme isn’t crisp, but the poem is more interesting for its degree of unpredictability, and the flame/slain/name rhyme balances with the inconsistent meter to create an engaging contrast. Neither of these men was older than twenty-three at the time of writing. Their skill might seem exceptional to modern audiences, but it would have been more commonplace among nineteenth-century elites, for whom poetry was a popular genre. At the same time, the technical skill of these men serves as a reminder of the vast disparity between educated and uneducated soldiers. All three of these writers were officers, and they represent the most eloquent minority of the Confederate army. 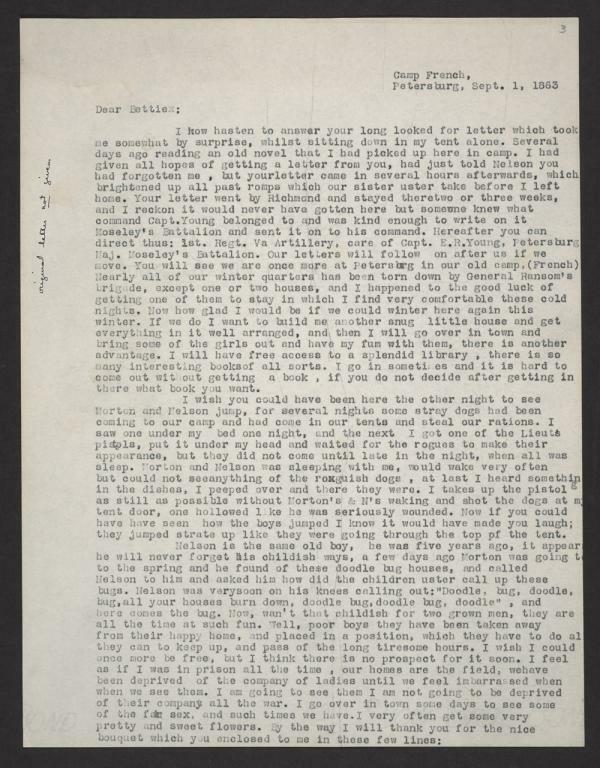 The CMLS manuscript collections also feature letters from soldiers who could barely spell, let alone pen verse. Private Jesse Hill bemoaned his own illiteracy in a letter to his wife. “I could tel it better than I can rite,” he confessed (1864 February 5). It may have been a verbal culture, but the privileges of literary education were available to the few, not the many. When contrasted with writing from less educated soldiers these poems show that white southern society was deeply stratified and wildly unequal. Though these poems are not exceptional in form or genre, they stand apart from the corpus of popular Civil War poetry because of their intended audience. “Poetry in the nineteenth century was a public act,” writes historian Richard Marius (xiii). Poets were meant to be “interpreters and instructors” to the nation, and thus dealt mostly in “patriotic gore” (Steinmetz, viii-xi). These poems, however, are not directed at the public at all, but are instead intimate works, each intended for an audience of one. A combination of factors led these poets largely to omit the battlefield from their homeward-bound verse. 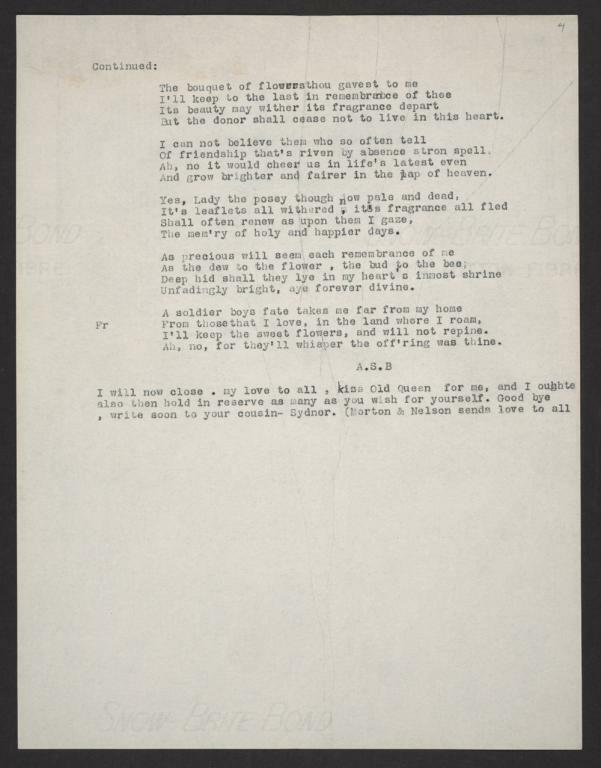 The poems show that soldiers were deeply affected by the defining fact of camp life – separation from their families. This struggle may have matched or at times overshadowed the tribulations of the battlefield. Both Barksdale and Doby emphasize the outsize value taken on by physical tokens from home – flowers for Barksdale, letters for Doby. In addition to surviving swords and shells, soldiers also had to survive boredom and loneliness. These poems show how much that loneliness weighed on them. At the same time, the soldiers likely felt the need to shield the women in their lives from the gory details of war. Some scholars blame this “spiritual censorship” for the general failures of Civil War literature (Steinmetz, viii). Whatever the motivations, these poems represent attempts to interpret the war on a personal level, not a societal one. Their intimacy makes them harrowing, and the grand pronouncements of popular war poems often feel empty by comparison. Barksdale, Cobb, and Doby show how powerful and inescapable literary conventions could be in the nineteenth century. The men benefited from this culture in some ways, developing into deft poets, while they were limited by the culture in others, bound by a set of tired images and themes. Their work captures the desire of Civil War soldiers to apply the customs of their literary moment on an intimate scale, and, perhaps, their inability to express themselves independent of those conventions. These aren’t typical poetic calls to arms, but rather, as Doby writes, “sweet messengers of Love.” When read as windows into men’s interior lives, they become remarkable. Barksdale, Anthony Sydnor. Letter, 1863 September 1. 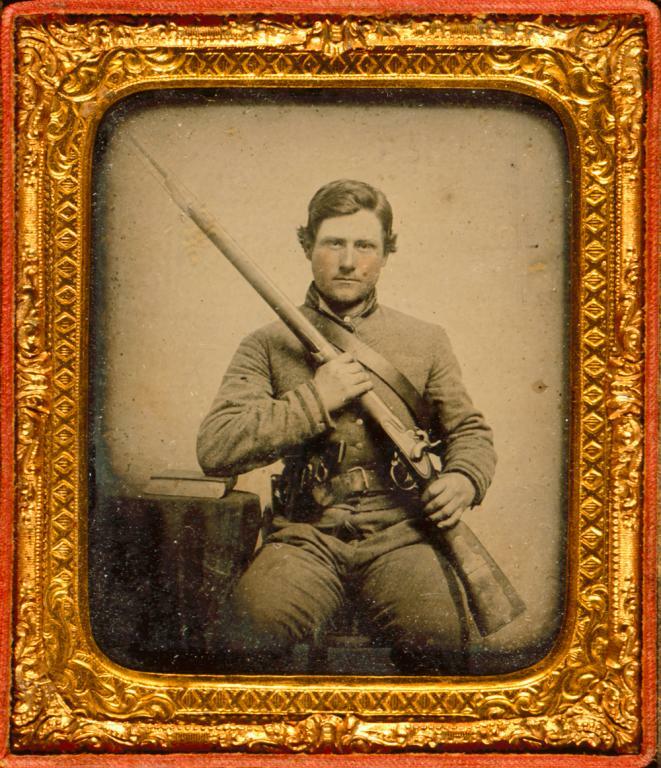 Anthony Sydnor Barksdale of "Roughville," Halifax County, Va., letters, 1862-1864. 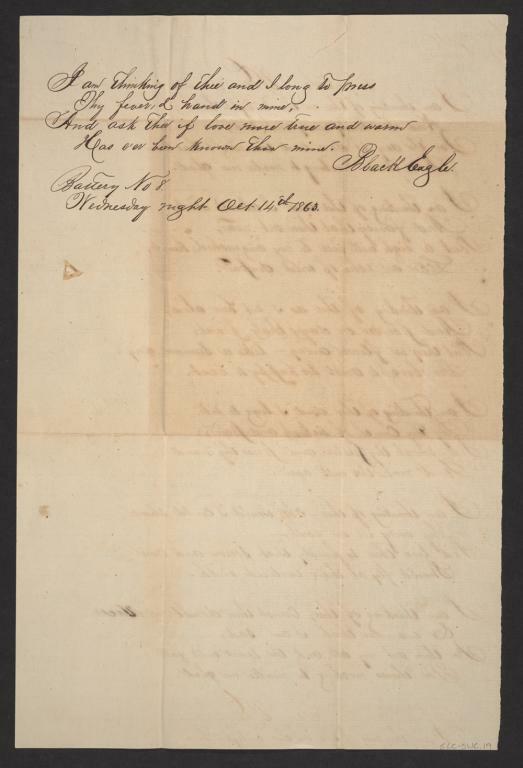 (Mss 2 B2471 b (CMLS)) Virginia Museum of History and Culture, n.p. Cobb, Seth Wallace. Letter, 1863 October 14. Victoria A.M. Davidson Farrar, letters, Richmond, Va., 1861-1873. (Mss2 F2462 b 14 (CMLS)) Virginia Museum of History and Culture, n.p. Doby, Alfred English. Letter, 1863 January 22. 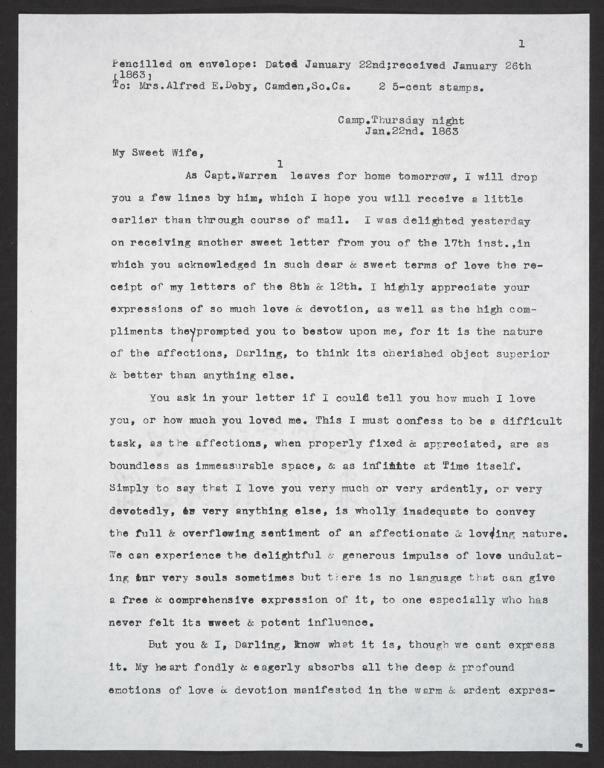 Alfred English Doby of Camden, S.C., letters, 1863 ( Mss2 D6563 b (CMLS) Virginia Museum of History and Culture, n.p. Hill, Jesse. Letter, 1864 February 5. The letters of private Jesse Hill a farmer from Davidson County, Company K, 21st Regiment, N.C. Troops, 1864-1865 (Mss2 H55302 a (CMLS)) Virginia Museum of History and Culture, n.p. Howe, Julia Ward. “Battle-Hymn of the Republic.” Poetry Foundation. 1861. Web. Marius, Richard. The Columbia Book of Civil War Poetry. Columbia University Press, 1994. Steinmetz, Lee. The Poetry of the American Civil War. Michigan State University Press, 1960. Timrod, Henry. “Ethnogenesis.” Encyclopedia Britannica. 1861. Web. Whitman, Walt. “O Captain! My Captain!” Poetry Foundation. 1865. Web.